SENIOR VICE COMMANDER JIM SLIS AND SECRETARY TREASURER NEAL BREAUGH PROUDLY CARRIED OUR COUNTRY'S FLAG AND OUR CAMP FLAG AT THE NORTHPORT COMMUNITY MEMORIAL DAY SERVICE. THIS YEAR, THE SERVICE WAS DEDICATED TO THE CIVIL WAR. ALTHOUGH IT WAS A VERY RAINY DAY, NO DROPS FELL DURING THE NORTHPORT CEREMONY. AT THE SAME TIME, COMMANDER JAN WHITE REPRESENTED CAMP 14 AT THE MEMORIAL DAY CEREMONIES AT MEMORIAL GARDENS IN TRAVERSE CITY. THE RAIN DID NOT SPARE THE TRAVERSE CITY CEREMONY, BUT COMMANDER WHITE UPHELD THE PROUD TRADITION OF ROBERT FINCH CAMP NO. 14. The following article appeared In THE NORTHPORT LEADER on July 14, 1932. The article was recently "discovered" by Mrs. Christine Garthe. Of intense local interest are a few facts concerning the old cannon, a relic of Civil War days, which has been resting on the lot by the Town Hall. This cannon was given to the Woolsey Post G. A. R. 399 by Congressman Bishop in 1901. It was given as a memorial to Civil War Veterans and especially members of the Woolsey Post. Mr. Jacob Vannatter is the sole survivor of the Woolsey Post G.A.R. 399 and as such is the real owner or custodian of the cannon. 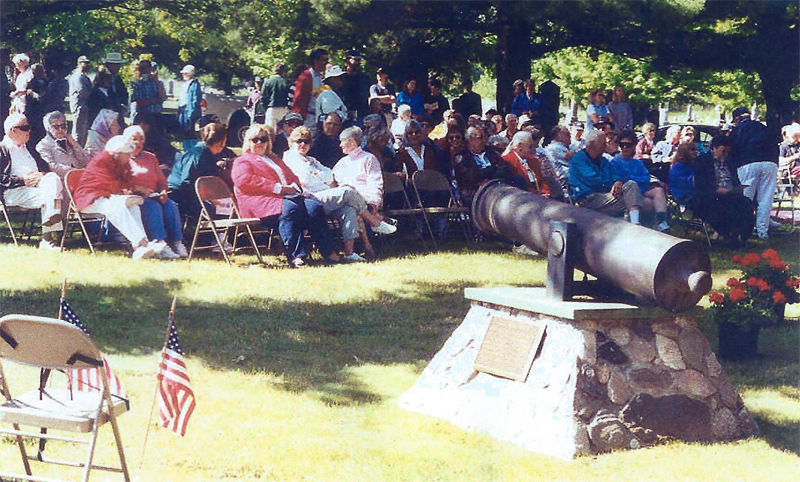 To show that the love of country and pride of patriotism still burns with unabated zeal in spite of his advancing years, Mr. Vannatter has given the cannon to the Northport Cemetery. It has been moved from the Town Hall lot to the new cemetery where it will remain and continue to service its purpose as the years move on. 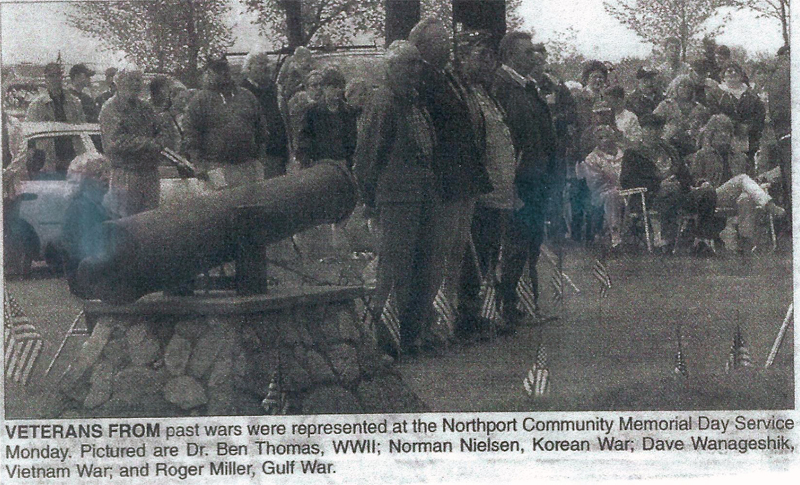 May we as citizens of our country and residents of Northport appreciate the noble sentiment and ideals that are embodied in this relic of by-gone days. A very special "thank you" to all who participated in this Memorial Day Service.